After three months in our salubrious studio at Castell Penrhyn, we are moving out to install our first exhibition at Storiel, just down the road, in Bangor. We have loved every minute of it, and diolch o galon, huge thanks to our very kind hosts at Castell Penrhyn: Being at heart of life at Castell Penrhyn, meeting staff, volunteers and visitors, has been one of the highlights of the two years we have been working together. Anyway, we thought we’d celebrate some of the highlights… but before we do, here’s an invitation to our opening on Friday - 12th April, 6.30pm. It’d be lovely to see you there. We even found a clock being thrown out by Castell Penrhyn to set atop our Dresel! 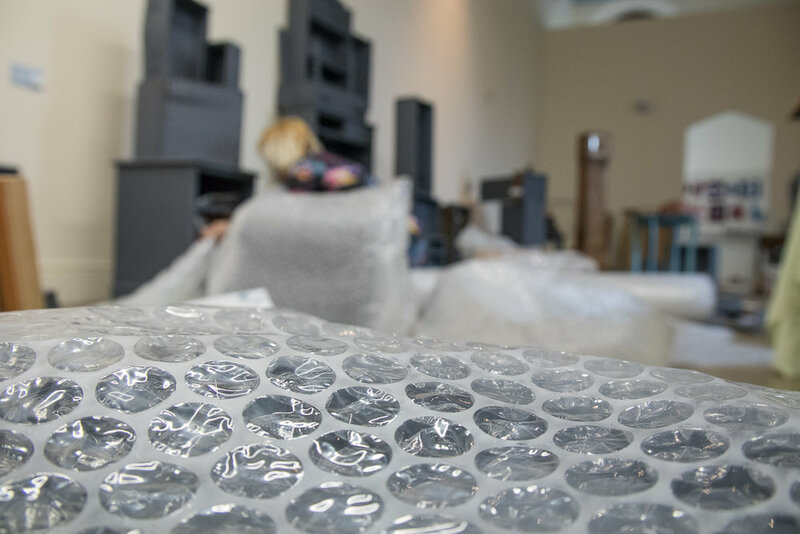 A few days enjoying mountain of bubble wrap (this weekend)…. Oh, how we’ll miss this place! But it’s onto new ventures now - 5 months in Storiel, Bangor. And in July we’ll also have an exhibition in Amgueddfa Llechi Llanberis, and in September two exhibitions in Blaenau: Llyfrgell Blaenau and Llechwedd Slate Caverns. We will also be organising some workshops (to add to the Groaning Dresser) and walks and hopefully some more singing/sound work… we’ll keep you posted! [PS: Here’s a quick timelapse of us installing at Storiel!